A perfect shave is not every one’s cup of tea. With today's hectic lifestyle many of us don’t have the time or money to invest in a traditional safety razor. It takes time to prepare, change blades and you need to shave carefully to avoid any cuts. The modern disposable razors or cartridges are much more convenient than safety razors. Multiple blades are placed in the best angle for shaving and come with skin guards to protect skin from any cuts or irritation. The cartridge type razors give a better shave and the blades can last up to 6 months after which the cartridge needs to be replaced. If you don't want to carry any grooming kit or if in a hurry then it is better to get disposable razors. The disposable razors can give good shave for a few weeks. Once the blades become dull, you can just dump the whole razor and get a new one. 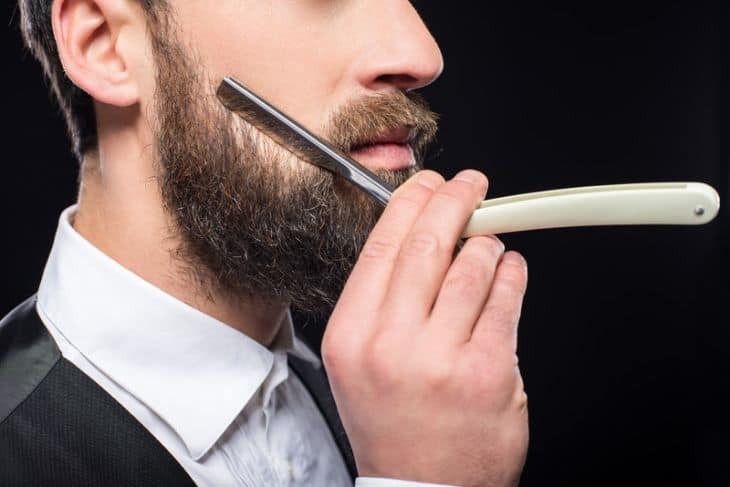 They are also much cheaper than getting a safety razor, electric razor or a straight﻿ razor which need high initial investments and continuous blade refills. The use and throw model is useful while travelling or for a quick clean up in office. Some of the factors to consider while buying them are the number of blades, lubricating strip, price and a pivoting head. We review some of the best disposable razors for men and women. The Schick Hydro is the best disposable razor for men that comes with 5 ultra-glide blades and a lubrication strip with unique gel reservoir. The hydrating gel ensures a smooth irritation free shave for a longer period. It also features a unique flip up trimmer which can be engaged with your thumb and perform precision trimming. Schick Hydro has a curved shaving head and a comfortable rubber grip. The package consist of 3 razors and offers best value for your money. The Mach series is a very popular series from Gillette and the mach 3 disposable razor features the same technologies in a Mach. The Mach has 3 spring mounted blades and a pivoting head that adjusts to your shaving to give an incredibly close shave. They have protective microfins that reduce cuts and nicks. These are specifically designed for sensitive skin and an enhanced lubastrip contains aloe vera for extra moisture. The pack contains 3 razors and though slightly expensive; it is the best disposable razor for sensitive skin. The Schick Slim Twin is another popular twin blade disposable razor. It has a unique lubricating strip formulated with Vitamin E to reduce irritation. It also has an easy one push cleaning button that keeps the blades clean. A comfortable rubber grip handle help you get a smooth and precision shave. The pack has 12 razors which offer good value for money and is one of the top-rated disposable razor for men. The Gillette sensor 3 is one of best disposable razor for men that has 3 independently spring mounted blades and a pivoting head that gives excellent shave. It features Gillette’s Lubastrip to provide good lubrication which is great for sensitive skin. An anti-slip rubber handle makes it comfortable to hold and use. This razor is long lasting with a life of 3-4 weeks. The blades are designed for better rinsing to remove any clogged hair from the razor. It comes in a pack of 8 razors, offers most of the features of a cartridge razor and is one of the best-selling disposable razors. The Gillette Sensor2Plus is a twin blade razor with a pivoting head. It has lubricating strips for a comfortable shave. A soft ultra-grip help you to hold them easily. The pivoting head gives a clean and close shave and the quality of the razor is quite good. One pack consists of 10 disposable razors and they are inexpensive. It comes in a zip pack which makes it convenient to store the razors. They offer good shave for a decent price and is another best-selling disposable razor for men. For women, the disposable razors must be able to reach all the curves and insides of the body causing no nicks or cuts. The disposable razors are handy if you are travelling and you don't have your epilator, shaver or w﻿﻿axi﻿﻿ng ki﻿﻿﻿﻿t with you. This is one of the best ladies disposable razor that has 3 blades with a pivoting head. An easy glide MoistureRich lubrication strip help razor glide easily on your skin to give a extra-close smooth shave. It has skin protective micro fins that help reduce nicks and cuts. A well designed curved handle makes it easy to maneuver around hard to reach areas like ankles and knees. The pack contains 4 razors at a good price and last longer than other disposable razors. Schick Hydro silk is one of the best disposable razor for women and has 5 curve sensing blades with unique skin guard to give a close shave. The razor head is surrounded by a water-activated moisturizing serum that replenish you skin’s natural moisture for up to 2 hours after shaving. An oval head and curved body can easily access hard to reach areas. A soft rubber handle with grooved grips gives it excellent control. The pack contains 3 disposable razors. 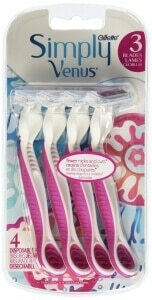 The Gillette Venus sensitive skin has 3 blades surrounded by soft protective cushions. They also have a moisture rich strip with more lubricants that easily glides the blade over sensitive skin. The pivoting head and specially designed non-slip handle can easily navigate hard to reach areas of the body giving you a smooth comfortable shave. It comes in a pack of 6 disposable razors and is the best disposable razor for sensitive skin. This is another good performing disposable razors that comes in variety of colors and more suited for students. A triple blade system gives an effortlessly smooth shave. The blades are relatively sharp and gives a smooth shave. It also has a lubricating strip and rubber handle grip for comfortable shaving. The kit contains 8 different colored razors. The razors can give up to 10 shaves before it is time to toss them out. Gillette Venus Original is the first 3 blade razor for women from Gillette and has a lubrastrip with aloe vera for a nick-free shave. There is a blue indicator strip that fades away in time indicating it is time change the cartridge. A shapely handle with soft grip gives an enhanced shave. The pack consists of 2 cartridges also. This is another best disposable razor for women from Gillette. We hope the above reviews help you to choose a good disposable razor that suits your needs and budget. Nowadays they offer great convenience and a good quality shave lasting few weeks. Another advantage is you don't have to spend a lot of time and money to choose a good disposable razor. Ladies can check this video to learn how to shave your legs.